I started thinking about my accountancy career after entering college. I started as a lifeguard and swim coach at the age of 15 in Ridgefield, New Jersey. I held both jobs on-again off-again until I was 21. I am also a Resident Assistant here at Bentley University, a position I have held since my sophomore year. I am tasked with maintaining the safety of our housing facilities, while also creating positive living-learning environments and assisting the residents of these communities. These positions reminded me that I felt I would work best in a career that was minded around serving and helping others, regardless of the fashion in which I did that. I was a hospitality major in high school (I went to a trade school), which confirmed such a thought, but I was always focused in the business administration mindset of the hospitality industry so I took classes and projects on accounting, economics, and entrepreneurship and loved them all. I excelled the most, however, in accounting, and took an internship (a high school graduation requirement for me) in government accounting with the Bergen County Division of Treasury and really enjoyed it. I held this position from my senior year of high school until I was a junior at Bentley. I also spent one summer in a quasi-public utilities authority as an accounting intern. Both were fascinating experiences, but I knew I wanted to try something outside of government and in larger practice, so I applied to many of the large firms, was offered a position with EY and took it! I became interested in accountancy from high school. My classes and experiences in high school with accounting and economics, combined with my success in GB112 and 212 at Bentley led me to be interested in accounting. My father is also an alum of EY so I grew up very exposed to the accounting field and financial world and was always very interested in it. I find the most rewarding aspect of my position is all the different people I get to help. In most of my prior roles, I found helping others achieve their goals to be the most rewarding. As an accounting intern, I often supported departments or business functions that were behind, short staffed or in need of some extra assistance. Being able to learn about my future career while also help longtime professions do their job was really rewarding. Many of my coworkers still reach out to me to share their gratitude for the help I gave. As a swim coach, I had a diverse group of children who came to the sport of swimming and to my team with different objectives. Some wanted to go on to swim in high school or college, like myself, others used my team as a form of cross-training for another varsity sport, and others just wanted to do something to build their confidence and enjoy. It was very rewarding to see at the end of my time coaching this summer that my swimmers had gone on to find success with many club teams, in many different sports, or had just found confidence in themselves. I had two parents tell me that I am “a continuous inspiration to [their] daughter” and that “[my child] still idolizes you to this day”/ Hearing about all their stories and the positive impact I was able to make is by far the most rewarding part of my prior work experience. I find the most challenging aspect of my position is the balancing act of it all. In compilation of all my prior roles, the most challenging aspect of any position I held was balancing many moving pieces. As an intern for smaller office, I did not receive any defined work or a specific duty to handle long-term. Therefore, I relied on smaller, as-needed basis projects. Sometimes, I would have valleys in my duties, however, many times, I found myself overwhelmed with requests from different places. Similarly, being a swim coach requires handling many different aspects. Interactions with swimmers, preparing for practices and meets, administrative duties, conversations with parents, finances, public bureaucracy… the list goes on! In both places, I found handling multiple responsibilities at once challenging. The most helpful advice I have for someone preparing for this career is to find what makes you happy. When I was a freshman at Bentley University, Professor Elizabeth Brown of the Law Department gave a speech at Convocation. Even as a senior, one takeaway she gave stuck with me. From what I can recount, she gave an anecdote about her prior career as an accomplished lawyer, but said she felt little happiness from it. She then found a passion in teaching, and combined her talent in law with her passion for teaching and became a law professor. Her takeaway from her story was not to pursue what you are good at but to “find something you enjoy being good at”. Everything I have done during my time Bentley has been based around that mindset. I find things that I enjoy and hope to excel at. For me, this was a great takeaway for a career minded time of my life and something I used when finding a path for me, and is a mindset I continue to use! The Bentley specific resources I would recommend to someone pursuing this career are the excellent courses, professors, and activities Bentley offers. Anything about the Bentley University experience can give insight about a career pursuit. Course wise, the GB’s are especially useful. While they are challenging and tedious at times, many students have recounted that they excelled and felt excited about what they were doing in the courses most closely related to their current major. Speaking with professors also helps, as many of them came from the fields they teach and can offer their own insights and personal reflections. Student life activities really help too! I found that I learned the most about myself outside of the classroom in places such as my summer jobs, time as an NCAA athlete, or as an RA. Take in the entire college experience, everything about it is meant to prepare you for your future! The person that was most helpful in getting me where I am today was my amazing coach.At Bentley University, my swim coach Mary Kay Samko has had the most impact on me to lead me to where I am today. Coach Samko is a coach who not just invests herself into the athletic performance of her student-athletes, but into the overall performance and well-being of them, as well. She is often sought after for career and academic advice, and sometimes has talked team members through personal struggles as well (myself included!) She is a mentor and a role model, and it shows in the respect her athletes have for her. Back to Professor Brown’s anecdote, she is a prime example of this. She found a career that where she shows that her passion is unparalleled, and her 400 dual meet wins, conference titles, NCAA All-Americans, and shattered team records at Bentley all speak for themselves about her performance as a professional. As my coach, she has enabled me to improve and perform tremendously as a swimmer, and I am proud of the successes I have achieved on the team. Further, my growth in the pool served as a parallel to my growth out of the pool and I am proud to say that being a part of Coach Samko’s team is a large reason why I am the person I am today. 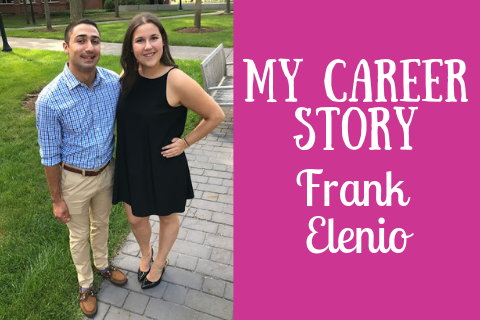 Be sure to connect with Frank on LinkedIn if you want to learn more from him about accountancy, EY, or more!